The Labour leader is expected to be near major anti-fracking protests at the end of the week. He should join the movement against dirty energy, Natalie Bennett writes. 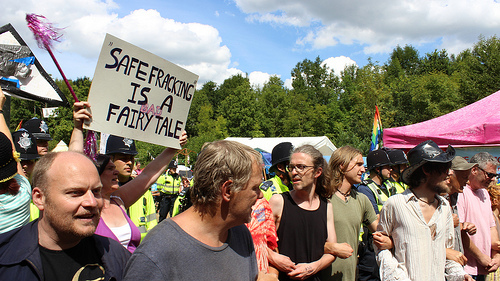 On Monday I made my third visit to the Preston New Road anti-fracking protection camp. It was a visit I hoped I wouldn’t have to make, given the powerful, continuous protests which led to Lancashire County Council rejecting fracking plans there in 2015 and the massive public rejection of the whole industry. All that, only to be over-ridden by the Tories in Westminster. It was ‘Green Monday’ at the camp, the first in a series that will also see deputy leader Amelia Womack and co-leader Caroline Lucas visiting in the coming weeks. The energy and determination of the campaigners is obvious – the protection camp now well settled and organised. The formidable Nanas are there in (peaceful) force – and several of the people I spoke to were also newcomers. There’s a continual supply of new protectors alerted to the fact government policies are supporting fracking and the fossil fuel industries just as the rest of the world races ahead with the energy future of renewables. And persistent locals, greatly concerned about the local environmental impacts, the certain lorry movements and pollution, as well as the risk of spills. What the anti-fracking movement has achieved, since that first protest in Balcombe back in 2013, must be celebrated. Back then the industry expected to be up and running by now, yet it’s gone nowhere – from Balcombe to Barton Moss, Upton to Ryedale and at many other sites, it has encountered consistent peaceful public opposition in communities across the land. But of course the protesters would like to be elsewhere – doing more positive things, not having to fight against a dinosaur industry backed by a government still locked into dubious ties. After a highly successful month with Reclaim the Power’s Rolling Resistance at Preston New Road, the campaign is looking to build on that energy – to bring to a final close the already staggering efforts of Cuadrilla to frack Britain. So here’s a direct message: Jeremy, I know you’re expected in the area at the end of this week. Will you visit the Preston New Road anti-fracking campaigners? Labour’s manifesto in this year’s election was against fracking, although it faces opposition to that position from some powerful supporters. Now’s a great time for it to step up to the plate and deliver on its manifesto pledge to oppose fracking. A demonstration of that commitment from its party leader could be the final blow to Cuadrilla. Indeed, to the whole industry. And it would be handy if Vince Cable came along too to Preston New Road to show that the Liberal Democrats’ commitment is also more a few words in a manifesto. Where the SNP stands on fracking isn’t entirely clear, but if the opposition united in parliament against fracking, the numbers could get very interesting. All this could start with a short visit down the road from already-planned activities by the Labour leader. It’s over to you, Jeremy. Natalie Bennett is the former leader of the Green Party of England & Wales, and the Green Party candidate for Sheffield Central. In New Zealand the Green Party has just been torn apart by the incompatibility of trying to line up Green environmentalism with Left wing politics. They aren’t the same at all and trying to fit them together is a disaster. If LFF swallows the lies of the environmentalists, you will be dragged down the same rabbit hole. Fracking is not “dirty”. Despite the constant lies to the contrary, it is an old technology with few risks if properly regulated (fracking for unconventional gas is new, fracking is many decades old). The only risk is dirty water spillage, but then every second industry manages to cope with that problem. People need jobs. Britain’s poor do not need expensive power from subsidized solar and wind. If you stand for the workers, then fracking is something that you should support. Gas is far cleaner than coal (less sulphur, less CO2 per unit of power) and is the only reliable alternative short of nuclear — which Ms Bennett is, of course, even more against. Because she actually wants us to go without. From the perspective of the chemical industry on Teesside, faced with the depletion of oil and gas from the North Sea, the feedstock basis for chemicals that clothe us , furnish our houses and are essential to all sorts of new advanced materials of all kind, can someone find a hole in the moral equivalence of imported liquefied shale gas from the US, or using UK shale gas from wells less than a hundred miles away from the big estuarial plants that are the end users ? Environmental health (EH) short, medium & long term v’s jobs. Which would you really prefer? Do you think that your government cares about medium or long term EH, health & Safety, the control of substances hazardous to health, etc. Not if it is going to cost any more money. ‘Thanks’ to some politicians, some areas of the country are absolutely desperate for work. They have got you ‘over a barrel’ & they know it. I wish that I could suggest some possible answers other than throwing in a wild card to get (through the TUC?) some completely independent advisors on ths serious EH, safety problem as well as any possible concomitant climate change problems with shale. Come on Jeremy, it’s time to push back hard against this planet destroying, climate change accelerating, dirty industry. Get behind the anti-fracking movement. Jeremy Corbyn: doing his best for the American and Russian gas industries.